Normally I can’t resist tweaking a recipe, but not this time. As soon as I read this article and recipe in the New York Times for Momofuku Bo Ssam, I began to plan my week around making it. Adapted from the Momofuku cookbook by David Chang and Peter Meehan, this Korean-inspired recipe has perfection written all over it. Despite its exotic name with a restaurant pedigree, I might call this dish Lacquered Slow-Roasted Pork. The meat alone is a masterpiece, oven-roasted to a crispy, caramelized heap with nothing more than copious amounts of sugar and salt. It’s then wrapped in lettuce (ssam), brightened with an intoxicating muddle of ginger and scallions and thoroughly electrified with a fermented bean and chili sauce which will rock any Scoville Scale. If it’s not broken, then don’t fix it. I have adjusted ingredients to suit my pantry and adapted the quantities to generously feed a family of 4 with lots of leftovers. Place the pork in a large bowl. Combine the granulated sugar and 1/2 cup salt in a small bowl. Rub all over the meat. Cover with plastic wrap and refrigerate overnight. When you are ready to cook, heat oven to 300 F. Remove pork from refrigerator and discard any accumulated juices. Place the pork in a roasting pan. Roast in the oven until the pork is falling apart tender, about 5 hours, basting occasionally. Remove meat from oven. Increase oven temperature to 500 F. Rub brown sugar all over pork. Sprinkle with a little salt. Return to the oven. Roast until a dark caramel crust forms on the pork, 10-15 minutes. Remove from oven. When cool enough to handle, shred into pieces and large chunks. Arrange on a serving plate. While the meat is roasting, prepare the ginger-scallion sauce and red chili sauce. Combine all of the ingredients for the ginger-scallion sauce together in a bowl. Taste for seasoning and set aside. Combine all of the ingredients for the red chili sauce together in a bowl. Set aside. 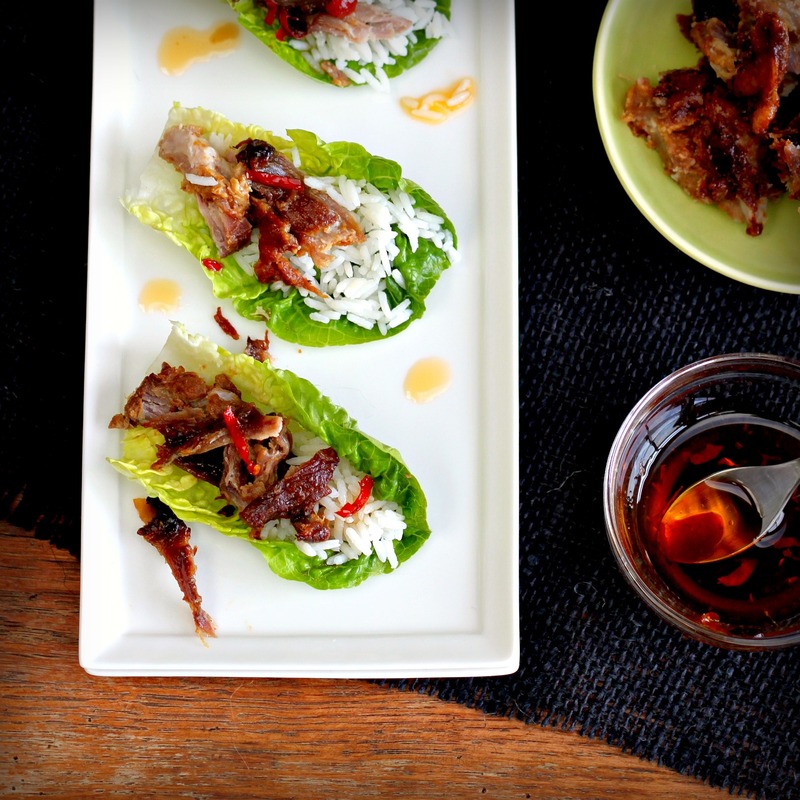 To serve: Place a few forkfuls of shredded pork in the center of a lettuce leave. Top with rice, ginger-scallion sauce and a drizzle of red chili sauce. I too saw this in the NYT but wasn’t brave enough to try it – heavenly. Those look really good! I love the idea. This looks amazing. I don’t use shoulder very much, except for in BBQ and sausage and really need to break out of that mold. This looks like a great way to do that. Oh my, it looks like dessert in the form of pork. I’m not sure if that even sounds good, but it’s meant to! Good follow through! We clipped it out too but got interrupted by … oh who knows, life maybe? Dropped the clipping into a bottomless box just today, thanks to you I will retrieve it! As a wimpy vegetarian, I make a very conscious, thoughtful, decision on my rare wanderings into meat, and I consciously choose this recipe! I really need to try this. I was at a function last night that served hoisin pork in lettuce cups that was so good, but this looks just amazing. This looks divine! I love Korean roasted pork- it’s one of my favorite splurges. There’s a great Korean restaurant near me that makes roasted pork sliders that I crave all the time- this dish looks similar. I’ve always wanted to go to Momofuku- will put this recipe on my must-try list! This looks fantastic! This one has been on my short list since the NYTimes article and now it is even higher. Love the photos too! I love serving this dish. Cracking it open at the middle of the table and letting everyone build their own Korean taco. David Chung serves them with raw oysters as well. That is a perfect combo. Just love this dish. It is also really affordable way to feed a crowd as well. My mouth watered as I read the recipe, Lynda, which is really hard to believe because I just finished a very tasty lunch of left overs! I’m definitely going to try this for our next dinner party. Gorgeous colours too. You had me at Momofuku! This looks spectacular, and your photos are gorgeous as always. It’s been too long since I stopped by your beautiful blog – I have a lot of catching up to do! These look divine! 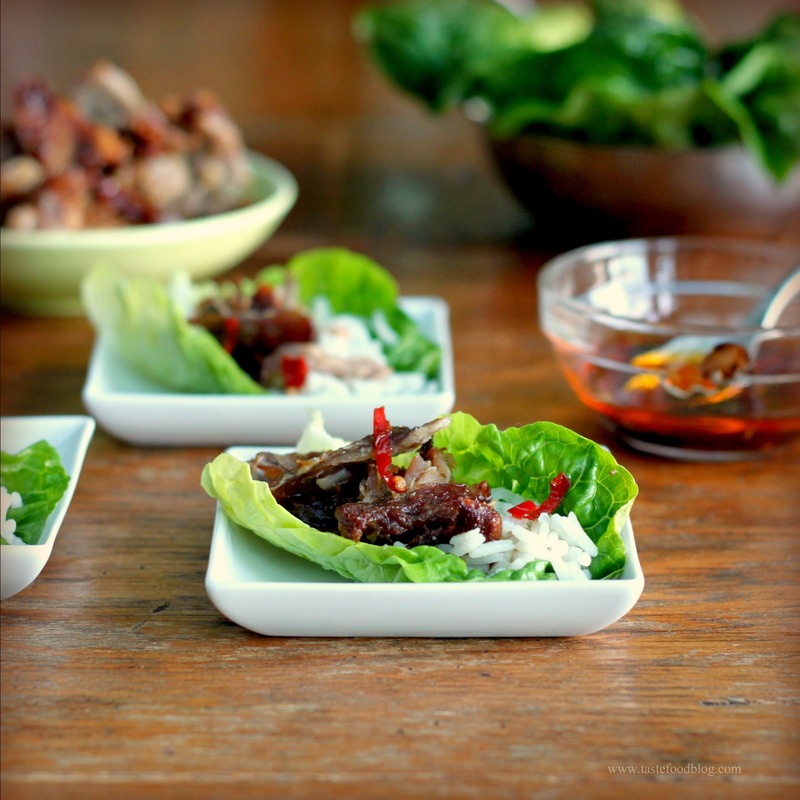 Love putting things into lettuce cups, and love the crispy glazed meat with such wonderful seasonings! Need a little shopping help (great Asian supermarkets here in PDX but a little intimidating if I don’t know what I’m looking for). Do you have a brand of the fermented bean and chili paste that you recommend? Thanks! Amen sister…there’s no need to mess with perfection. I will absolutely be making this for the clan, thanks for sharing. Love your overhead shot! Oh yeah! They look amazing! Oh my, this is right up my street. I’m drooling at the thought, thanks for sharing. My roommate has made this dish at home a few times now, and I’ve watched/helped her with it before. For some reason, my solo try tonight turned out just horrible. I used a little under 1/2 a cup of sugar and kosher salt each; after 7 hours in the oven at 275 degrees, the pork still hadn’t collapsed to what I was used to, and it came out way too salty. We weren’t able to eat much of the pork. Any ideas on what I might have done wrong? No, I am not sure what may have gone wrong if you precisely followed the recipe. The pork will indeed be salty due to the rub, but it shouldn’t overwhelm. If you try again, increase the heat of the oven to 300 F and baste frequently while it’s slow cooking. Good luck! In my experience you absolutely have to rinse the pork shoulder after brining it. If you leave it covered in that much salt it will be very overpowering and unpalatable, plenty of salt is absorbed over night anyway. As far as getting the pork to the proper tenderness, this is all about internal temperature. You want the meat to cook to about 190-195 F, so when you take it out to baste it (which isn’t really necessary either, in my opinion) check periodically with a meat thermometer. At this point it should pretty much fall apart. I also keep about a cup of water in the pan below the rack the shoulder is sitting on to prevent the drippings from burning, this way you can remove some of the fat and use it to make gravy for some other recipe if you like (makes cleanup easier too). I’m making this now and wondering if I should cover the pork while it is roasting-there are no directions to do so, so I am assuming not to cover. I’m being a bit creative with the sauces as I decided to do this when I finally found the correct cut of meat at the commissary (we are in Germany) but don’t have the exact ingredients for the sauces. I have Korean BBQ sauce and hoisin sauce. Having my husband search the commissary for sherry vinegar as I didn’t have the recipe with me when I was there…and picked up the scallions, lettuce for wrapping and the ginger at the Wednesday farmer’s market this morning. Can’t wait to try it! Roast uncovered and baste occasionally. Enjoy! I’m at the final step of making the sauces. The anticipation is killing me. The house is filled with the aroma of the pork. I added a handful of spices to the marinade – fennel, Szechuan peppercorns, cassia bark, star anise. I also decided to cover the pork (used neck as they call it here in Australia) and cooked in a Le Crueset pot. Released some amazing juices which are have been combined with my homemade kimchi and green onion and chicken broth to make a soup. Goodness! I love it.� Now you have me thinking I should make this again – soon. Made it last night. I just cubed some pork shoulder and browned it. Then added a bunch of water to cover and simmered for 3 hours. Then I drained it and shredded it, sprinkled it with brown sugar and grilled it. Everything else by the book. It was really, really fantastic. Thanks! I cooked this with the fat on the top. Does the brown-sugar coating go on top of the fat layer in the final step, or on the meat? Brown sugar on the fat side – however, most of the fat should have cooked off in the slow-cooking process. Can bo ssam be made a day in advance? Yes. I would suggest slow cooking the day before, then refrigerate overnight. The day of serving let stand at room temperature for 30 minutes. Then continue with the brown sugar and roasting step.